Kitty would like to let you know that the Punctuated Rib socks have received her feline stamp of approval. She wouldn’t leave them alone until I fell out of the armchair (it was a hilarious moment of klutziness, and no one was hurt) and created enough clatter to make her shimmy to another room. Pattern: Punctuated Rib Socks by Ann Budd from Knitting Socks with Handpainted Yarn . My review/preview of this interesting new book is here. Yarn: Madeline Tosh 100% superwash merino in Lichen. I used one skein, which contained 395 yards. At the end I had about 4.6 grams of yarn left over, probably enough for another inch in length. Needles: Susan Bates US 0 dpns. I switched to US 1 for the last 2″ of the sock cuff, though the instructions told me to do that much earlier ;). Though I made a bunch of little changes here and there, I basically worked the pattern as written. This is one of those great designs that takes the same mental energy as a 2×2 ribbed sock, but evolves into something much prettier and more interesting. 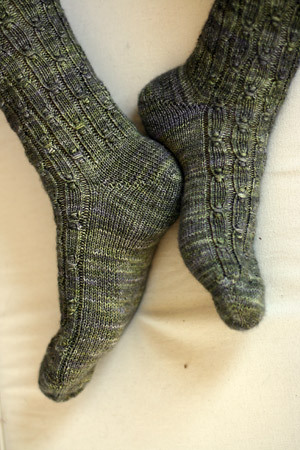 Totally noteworthy (again) – Cat Bordhi’s short-row heels, found in her book New Pathways for Sock Knitters . Also, Cat left me a comment on my last entry (!) letting me know about a set of videos on YouTube which includes a demonstration of this technique and others – check it out! The socks have already been received by my grandma, and promptly passed on to my mom. For this, my grandma apologized profusely. I don’t know why – it so doesn’t matter to me whether mom or grandma wear them! I’m actually happy they went to mom – this is her first ever handknit pair of socks (and I have already taken measures to make sure it’s not the last!). In the past she’s waved them away as being “too hot,” which I totally understand, as I don’t wear wool socks for the same reason. But we are allowed to change our minds, especially during winters as frigid as this one. The fact that these socks fit my mom (like me, she has very high arches and her feet are wide to boot) leads me to conclude that these socks were on the wide side. I knit the larger 68-stitch size and, if you’ll indulge me in a physics analogy, the ribbing stores a lot of potential energy for stretching :). I wish I had measured gauge before handing them over, but I didn’t. Yes, slightly big on me (look at those empty toes! ), but perfect for mom. They are stunning! Now your grandma is going to have to wait in line because your mom will be wanting more and more of your socks. Gorgeous. I bought that same book; it is the first one that may actually tempt me away from my plain-vanilla-I-can-knit-them-without-a-pattern socks. I have the book, too, so I’m very interested to read what you have to say – and to see the socks, of course. Fortunate Mum! So pretty! I’m dying to try the Madelinetosh sock yarn based on the colorways alone, did you like using it? These look great! I have a stalled pair of MadTosh on my needles I should finish. I think it’s about time your mom received some socks! It HAS to be cold enough for them! I hadn’t noticed that you had reviewed this book. It strikes me as the most interesting sock pattern book in a loooong time. And the socks you made came out lovely! Love the socks…but really love the video…so very simple. Don’t you think this pattern, in this colourway, looks like microalgae seen on the microscope? Very pretty! But I have to say — I cannot imagine wool socks being too hot! I spend a lot of time trying to make my feet warmer! Great socks ~ love the colour too! Ooh, I have a skein of Lichen in my stash…I love how these knit up! I think it’s funny that Grandma was so apologetic about passing them on to your mom! Those are gorgeous, and show off the yarn so well. Great choices! The socks are gorgeous! I have surprisingly small feet despite the shoe size, because they are fairly narrow. About half of the socks I make end up being just a smidge too big for my feet! Those are so cozy! Makes me want to pick up the small needles again…. I definitely have to check out Knitting Socks with Handpainted Yarn – I’m on a major sock knitting kick these days. Great socks and I’m so glad your mom finally took the plunge into handknit wool socks! That’s a beautiful pattern! Distinctive without competing with the yarn. They are beautiful! I am sure your mom will enjoy them. Please teach us how to prevent holes in short row heels when going toe up. I would be endlessly grateful! I also knit the first pair of socks for my Mom while I visited with her at Christmas. She was so thrilled that someone was actually making something custom-fit for her! She was so surprised that they actually fit her! But it was easy to do, and now I just hope she wears them and doesn’t just put them away because they are “too nice to use”. You Mom will love your socks. I think I will do that pattern for Mom’s second pair.